Being pregnant is both an amazing, emotional time and also a tough time. Your body is changing every week, you are carrying precious cargo and you probably feel tired, sick and bloated. Many women say that they won’t bother getting maternity photos and instead they will spend the money on baby photos and will just take a few selfies. I believe having maternity photos taken is something that you will be so glad that you did later on… and it will be also be an enjoyable experience! Why? 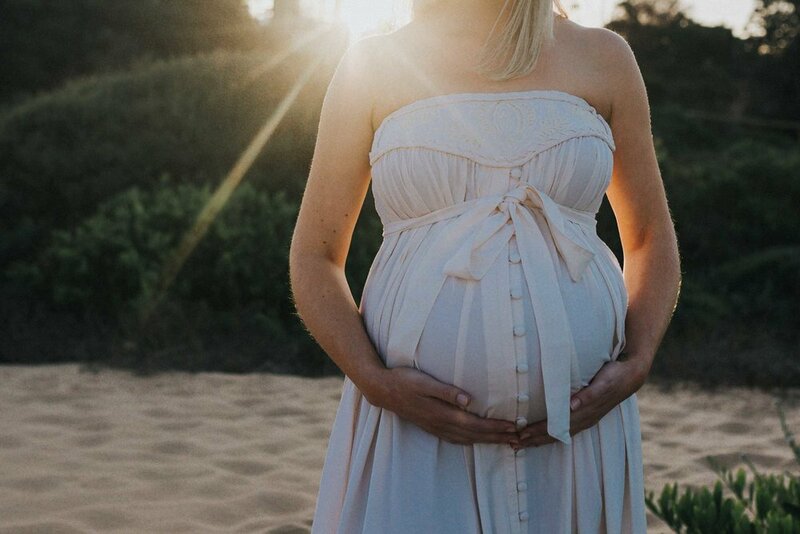 Because Maternity Photography is not just about photographing a bump…it is about creating emotive and authentic art that truly captures the depth and feeling of each moment in your journey to becoming a mother. Often, the most beautiful moments happen right at home. In-Home sessions are very relaxed, and I will guide you into some beautiful, natural poses. It will be intimate and beautiful and often it will just be you and me together in your bedroom chatting while I take photos. You can also include your partner, your other kids and even pets if you choose to. Outdoor sessions take place in the evening, when the light is most beautiful so we can get some dreamy, romantic sunlight (approx. 1 hour before sunset.) You are welcome to have a couple of outfit changes and we will wander along the beach, or park as I guide you and make sure you both look and feel beautiful. I also work with Mama Rentals who has an amazing collection of beautiful maternity gowns for hire, which are perfect for maternity or newborn sessions! As my client, you will receive an exclusive discount too! You can see the complete collection at the link above. Please enquire for details when booking your maternity session.